Qualcomm Life has announced the winners of the 2Net SDK Developer Challenge, which called on developers to create applications which intelligently integrate and visualize data streams generated from devices over the 2Net platform. The first, second and third place apps were awarded $20,000, $10,000 and $5,000 cash respectively. The 2Net Connect APIs were launched in August 2012 and are the first of their kind to provide a single, consolidated biometric data stream across radio technologies, device types, applications and services. Details on the winning applications and the 2Net SDK can be found on the 2Net developer website QDevNet. Telsano Health won first place with their application which aims to connect patient and providers through an online aggregation dashboard. The dashboard displays an individual’s overall health and fitness level. The app allows the user to set body composition goals to track their overall progress and better understand their current health and fitness levels and monitor their progress across 96 data points integrated in the system. The ultimate goal of the technology is to empower consumers with tools for positive health behavior changes. In addition to the $20,000 cash reward, the company has also won an invitation to present their solution at the upcoming mHealthSummit in Washington, DC. MyHealthDirect, submitted by Entra Health Systems, took second place for their comprehensive mobile and home health management system for health factor tracking and chronic disease management. 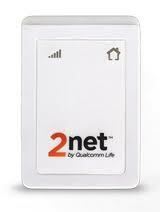 It leverages 2Net by integrating key biometric data streams from wireless devices interfaced within the 2Net ecosystem. HealthHub, which finished in third place, is a centralized data monitoring solution that collects and displays data from multiple digital health devices on one, east-to-use interface. Goal is to create a platform for aggregating and analyzing data in one unified place. The software is available to developers on multiple operating systems such as Android, iOS and Microsoft platforms through 2Net Connect Application Programming Interfaces (APIs). The 2Net Connect APIs were launched in August 2012 and are the first of their kind to provide a single, consolidated biometric data stream across radio technologies, device types, applications and services. USPM’S MACAW APP powered by Qualcomm Life links all the devices listed above. From there The Prevention Plan will give you a score. This helps you monitor your health with all the devices you use. Mhealth , Wireless devices and Prevention is the future of healthcare.